This cake really speaks for itself doesn't it? 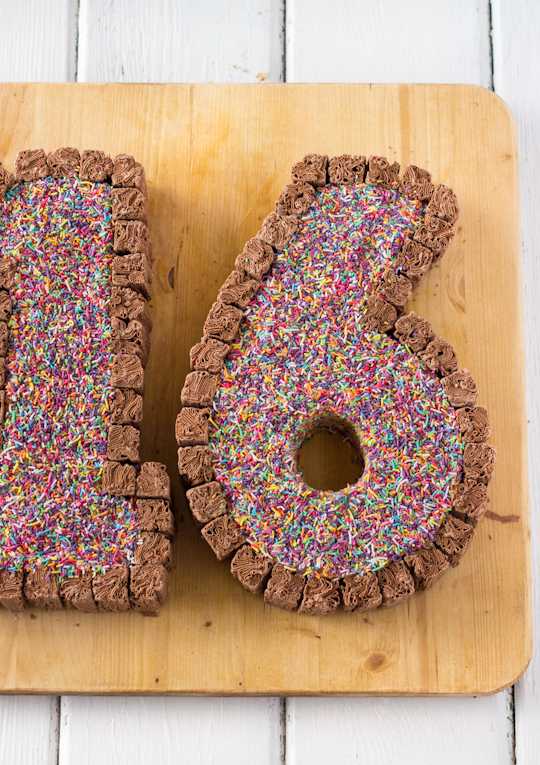 A Sweet 16 cake for a very sweet sixteeth birthday for my lovely sister-in-law. The brief was simple; no berries, not cheesecake (a favourite of my other sis-in-law), butter cake please. And one of her favourite candies was Flake. I took it as an opportunity to try one of these candy-covered cakes that I've seen around so much, you know the ones with a border of KitKats around them? 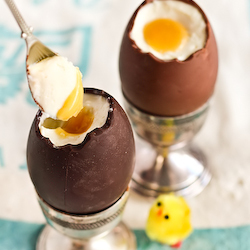 But with lots of mini-sized Flake chocolates instead! And I got to pull out my trusty old Australian Women's Weekly Birthday Cakes book (stolen off my Mum) to figure out how to cut the shapes of the 1 and 6. Oh, and SPRINKLES! Always sprinkles. The cake was my favourite yellow cake, with the addition of a bit of vanilla bean to make it a little bit more special. 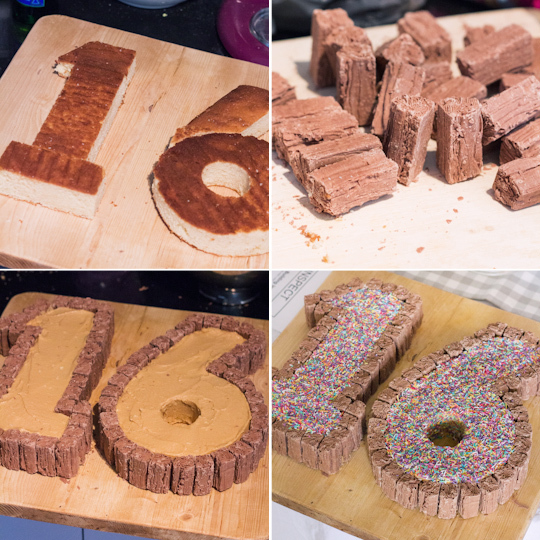 I baked a huge lamington trays worth of cake, cut it up into the shape of a 16 and covered it in dulce de leche icing. That's right. 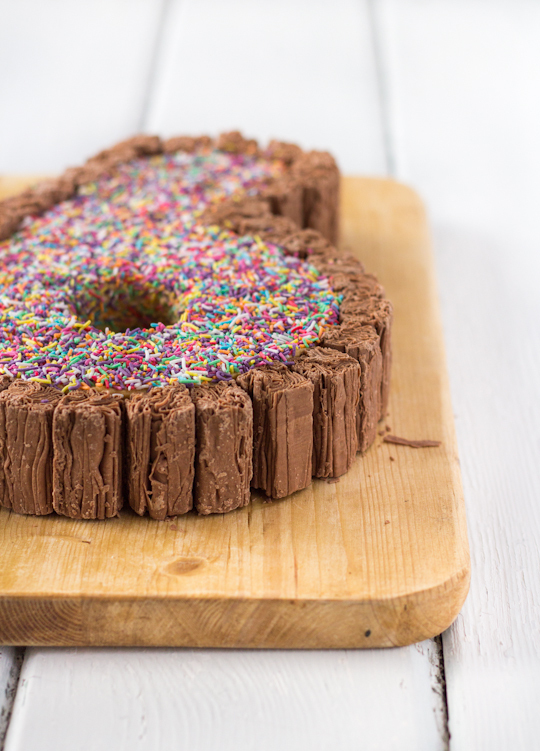 Then SIX packets of treat-sized flakes and a whoooole lot of sprinkles later, this cake emerged. It was surprisingly easy to put together and had a great visual impact. And it tasted great. 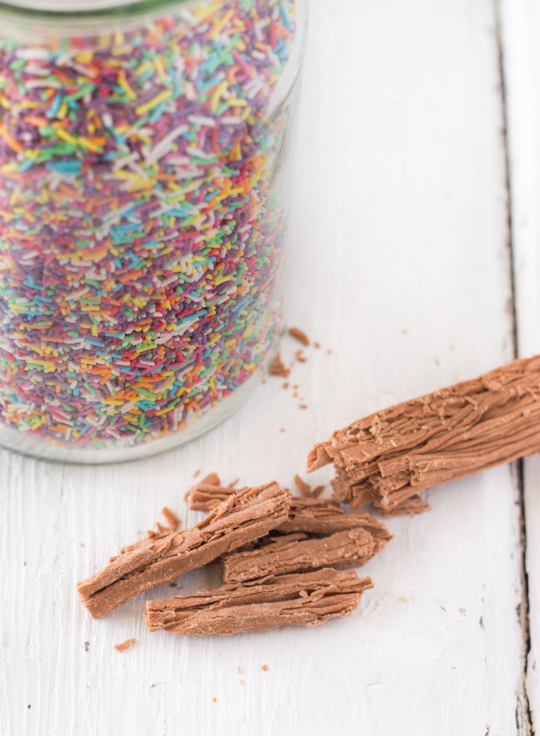 You could replace the Flake with any other of your favourite mini chocolate bars, and the sprinkles with anything else you want. Gummy bears are fun. This cake is an assured crowd-pleaser. It's crazy to think that she was an itty-bitty 3 year old when I first met A. Time flies at such a scary pace. Anyway I think the birthday girl thoroughly enjoyed her cake because she has requested the same one for her big birthday bash in a few weeks. Time to stock up on a whole lotta Flakes! Preheat oven to 180°C (350°F) and grease and line the base with baking paper a 24x32cm lamington tray (you can try to use individual tins but you will have to figure out the best sizes for the shapes that you need to cut out. Essentially you need three skinny rectangles and a large circle). Dust lined tin lightly with flour. Combine flour, baking powder and salt in a medium bowl and set aside. Mix milk and vanilla together in a measuring jug. Using an electric mixer on low speed, beat sugar and butter in a large bowl until blended. Increase speed to high and beat for 2 mins or until pale and creamy. Reduce speed to medium low, add eggs 1 at a time, beating well after each addition. Alternately add flour mix and milk mixture, beginning and ending with flour mixture (I did it by adding 1/4 of of the dry mixture followed by 1/3 of the wet mixture at a time). Beat until smooth, occasionaly scraping bowl with a spatula. Pour batter into prepared tin and smooth with a spatula, then bake until golden and a skewer inserted into the centre of the cake comes out clean (I think mine took approx 45-50 mins but oven times will vary). Cool in tin for 15 minutes and then carefully turn out on to a wire rack and cool completely. Can be baked the night before assembly, wrapped in clingfilm and refrigerated overnight. Cut your cake into pieces to form the shape of a 16 (you can sort of see what I did below, grab the AWW kids birthday cake book for clear instructions). Place butter in a large mixing bowl and beat with an electric mixer on high until smooth and fluffy. Add dulce de leche and with the mixer on low, gradually add icing sugar until smooth and combined. You can adjust the icing sugar to achieve the desired icing consistency. You want it to be easy to spread but to hold its shape. Use a spatula to carefully cover the whole cake in a thin layer of icing. 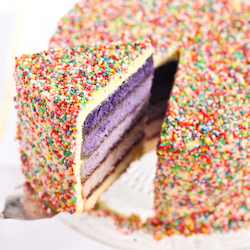 Place chocolate bars around the border of the cake and cover the top of the cake with rainbow sprinkles. Chill in the fridge until ready to serve, remove from fridge at least half an hour before serving. If there is one cookbook that I NEVER get tired of looking at, it's the AWW birthday cakes book. Magic within those pages! And this cake looks magic too! Amazing. and yes MORE SPRINKLES!! This is just awesome, love the flake idea! I love that you're from Sydney (like me) & there's so many Aussie-kids-of-the-90s references! Like the AWW Birthday Cake book - such an important part of my childhood! And all the Aussie chocolates like Flakes and Tim Tams and Twix. And of course I love all the sprinkles - Steph, you're awesome!! Wow, I totally forgot that K would've been almost a baby when you first met her, whoa. But how cool is it to see her grow up like that? I SO WANT THAT CAKE! this is such an awesome cake! beyond words beautiful! such a lucky sister in law! Oh, that's so gorgeous! 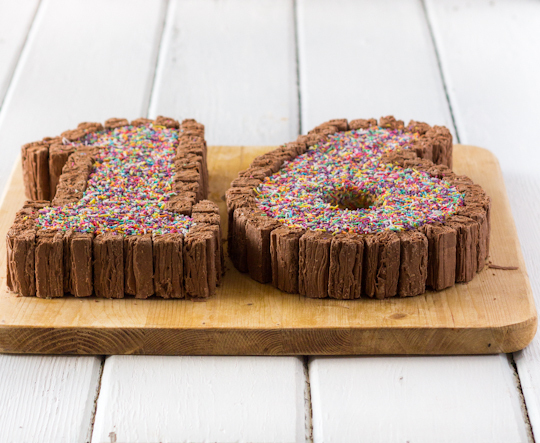 What a fantastic 'sweet' sixteen cake. What a cool idea and so adaptable, love it! 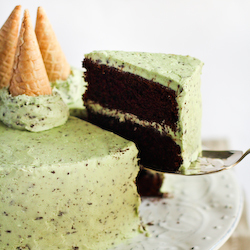 I really really like the look of this cake. Even more the sprinkle drenched top. ooh I love this! 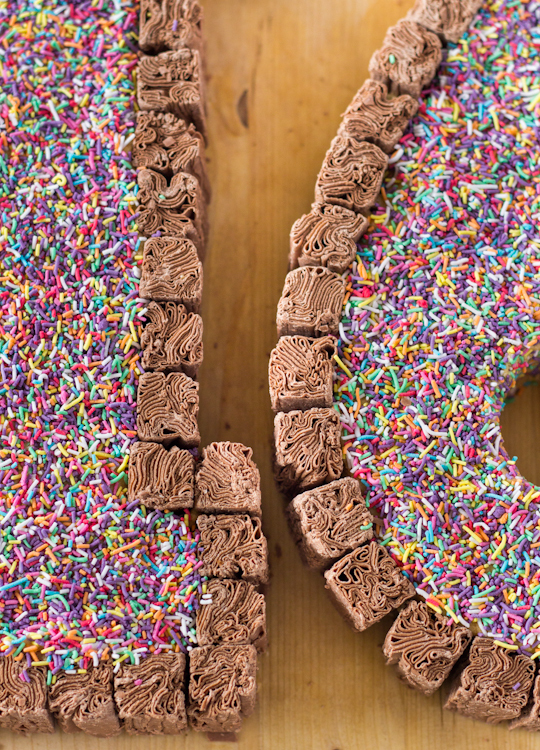 Flake is one of my favourite chocolates and who doesn't love rainbow sprinkles? This is so wonderful. The birthday girl is so right to want this again for her big party! The 16 looks perfect. 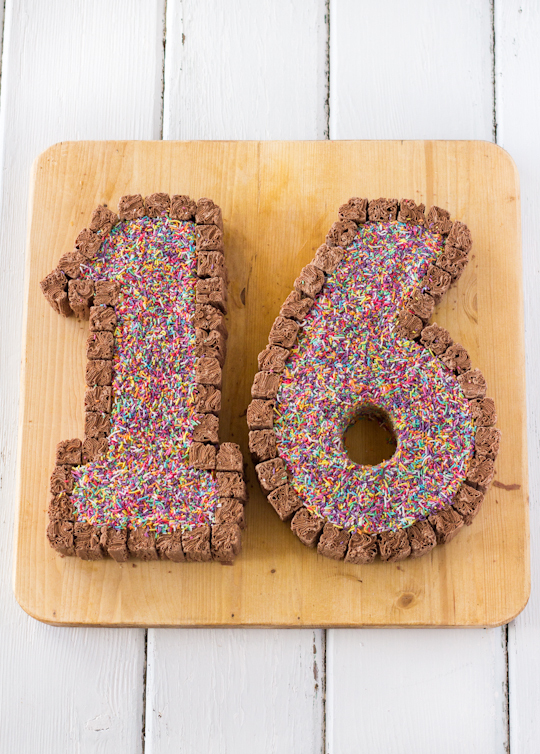 Wow, what a pretty sweet sixteen cake - fantastic job! Oh any girl would love this cake for her sweet 16! Perfect decorations and the fact you get a whole flake if not more in every slice is a great added bonus! 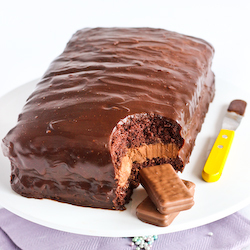 i love Flake chocolate so would love this cake. very creative! Hi, Can you pretty please make Butterscotch cake/pastry. I have been craving to eat and make one,but all the recipes on the internet calls for cake flour, which is a rare ingredient to find in Melbourne. I am sure you will be able to interpret with Aus ingredients and produce a good result. Will wait for your version of this cake. Holy cow, yes! This is totally going to be my 30th birthday cake! I love flakes and sprinkles. Heading off to steal my Mums Womens weekly for the 3-0 configuration. This is a great idea! I have the "number" cake pan set but have never used it. Not sure what "flakes" are but the cake is awesome! Gorgeous cake! I'd like to use this icing for a layer cake (2 x 9 inch round layers), do you think this amount would be enough?